United Nations : Russia and Syria have invited a probe into the alleged chemical attack on the rebel-held town of Douma after US President Donald Trump threatened that there would be a "big price to pay". Speaking at an emergency meeting of the UN Security Council on Monday, Russia's Permanent Representative Vassily Nebenzia denied that chemical weapons had been used in Douma and said Syrian authorities and Russian troops would provide facilities for experts from the Organisation for Prohibition of Chemical Weapons (OPCW) to visit the attack area. 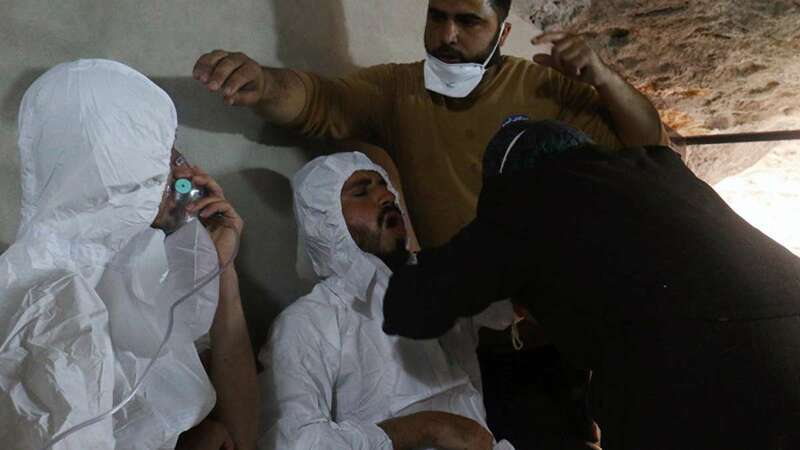 According to the reports, the chemical attack on Saturday killed at least 49 people and injured 500 others, Thomas Markram, the deputy to the UN High Representative for Disarmament Affairs, told the Council. During a bitter clash at the Council, US Permanent Representative Nikki Haley said that the hands of the Russian "regime" were "covered in the blood of Syrian children" and warned that Washington would respond to the attacks even if the Council would not. On Monday night, Trump met defence officials along with his newly appointed National Security Adviser John Bolton after warning that that there would he would decide within 48 hours on a military response to the "barbaric" act. "If it's Russia, if it's Syria, if it's Iran, if it's all of them together, we'll figure it out and we'll know the answers quite soon," he told reporters earlier on Monday. Haley said those responsible for the attacks were "monsters", adding: "We must not overlook Russia and Iran's roles in enabling the Assad regime's murderous destruction." With tensions between Russia and the West rising to Cold War levels, Nebenzia told the West: "We are not begging to be friends with you." He objected to Haley referring to his government as a "regime" and warned that he would raise a point of order the next time she did that - a move that could disrupt Council meetings, a frequent happening during the height of the Cold War. He said the "hawkish rhetoric" in the Council and threats to use force had gone beyond what had prevailed during the Cold War. Britain's Permanent Representative Karen Pierce said the situation today was worse than that during the Cold War because then there was no such flagrant disregard of the universal prohibition against chemical weapons. Nebenzia alleged that the anti-government forces had chemical weapons and could stage an attack. But France's Permanent Representative Francois Delattre countered that only the Syrian government and its allies had the capability to developing the chemical and said that there was no doubt about who carried out the attacks. Secretary-General Antonio Guterres's spokesperson Stephane Dujarric told reporters: "While the UN is not in a position to verify these reports, the Secretary-General notes that any use of chemical weapons, if confirmed, is abhorrent, and requires a thorough investigation." Guterres's Speical Envoy for Syria, Staffan de Mistura, told the Council via a video link from Geneva that the terrorist group Jaish al-Islam that was in control of Douma had asked for UN intervention, but the Syrian government did not respond to it.